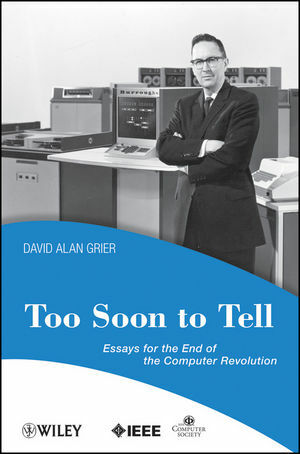 Based on author David A. Grier's column "In Our Time," which runs monthly in Computer magazine, Too Soon To Tell presents a collection of essays skillfully written about the computer age, an era that began February 1946. Examining ideas that are both contemporary and timeless, these chronological essays examine the revolutionary nature of the computer, the relation between machines and human institutions, and the connections between fathers and sons to provide general readers with a picture of a specific technology that attempted to rebuild human institutions in its own image. David Alan Grier writes the "In Our Time" column for Computer magazine and is the Associate Dean for Academic Affairs, The Elliott School of International Affairs, George Washington University. His first book, When Computers Were Human, won favorable reviews on NPR's Marketplace?and in Nature and Discover. Grier writes across a wide variety of genres, including general news pieces for the Washington Post, children's articles, and academic pieces for American Mathematical Monthly and the Communications of the ACM. Preface: To Have Been Young in that Hour. Section I: The Computer Era (1946-1973). Songs of Comfort and Joy. The Enduring Myth of Hardware. Section II: The Age of Information (1974-1987). The Language of Bad Love. On the Right Side of the Road. Section III: The Days of Cyberspace: (1986-2007). A Winter of Hope and a Spring of Despair. Ever Onward! Thanks for Asking! The Eyes of the World.